We spent the better part of 2014 (and the first part of 2015) waiting in anticipation for an El Niño event that was initially forecast to be one of the stronger events on record. 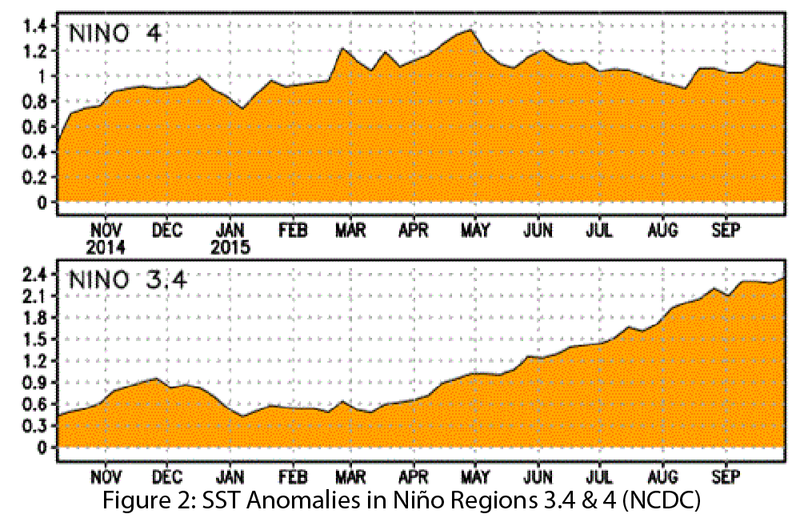 By early 2015, the event in question had not yet materialized, and some questioned whether El Niño would ever arrive. Eventually it did, and has been going strong for months, with most forecasts indicating that it will remain a strong event through the winter. As this event unfolds, there are numerous impacts we might expect to see across the Southwest over the course of our cool season (approximately Oct - Mar). In the coming months, CLIMAS will aggregate news, information, and commentary about the possible and expected impacts of El Niño, from the perspective of what is most relevant and applicable to the Southwest. This will include what we have learned from past events, and what forecasting and models can tell us about planning for this event. 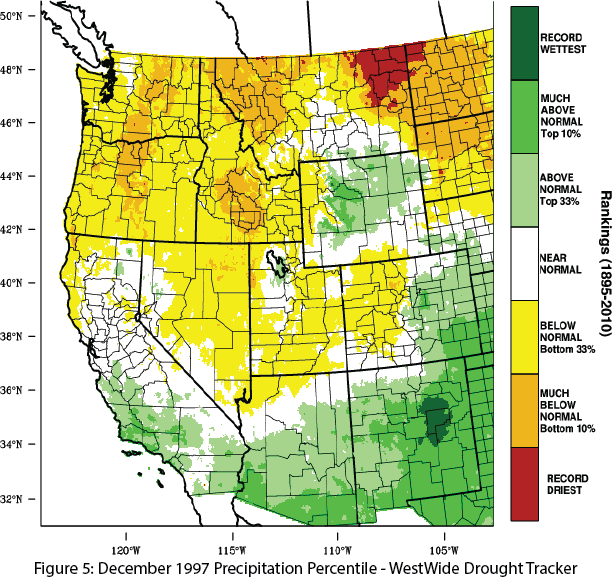 For more information, please visit our repository for ENSO related materials, which we will update with timely and relevant information about El Niño throughout the winter. El Niño conditions continued for an eighth straight month, and models continue to forecast a strong El Niño event that likely will last through spring 2016 and remain strong through the early part of the year. Forecasts focused on the persistence of sea-surface temperature (SST) anomalies (Figs.1–2) and weakened trade winds, enhanced convective activity in the central and eastern Pacific, and El Niño-related ocean-atmosphere coupling. 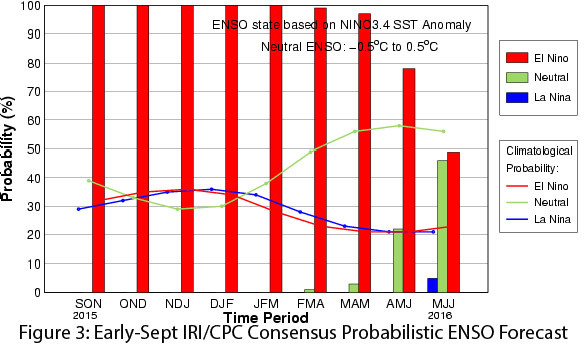 On October 8, the NOAA-Climate Prediction Center (CPC) extended its El Niño advisory, predicting a 95 percent chance that the current strong El Niño conditions will continue through winter 2015–2016, with gradual weakening into spring 2016 (Fig. 3). The center cited persistent positive SST anomalies in the central and eastern Pacific and ongoing ocean-atmospheric coupling and convection activity as indicators of an ongoing and strengthening event. On October 9, the Japan Meteorological Agency identified ongoing El Niño conditions in the equatorial Pacific, noting “remarkably above-normal” SST anomalies and convective activity, and forecast the current El Niño conditions would continue into spring. On October 13, the Australian Bureau of Meteorology maintained its tracker at official El Niño status, noting the strongest event seen since 1997, and forecast the event will persist into early 2016. On October 15, the International Research Institute for Climate and Society (IRI) and CPC forecasts indicated a 100 percent chance of El Niño through early 2016, and saw continued evidence in both the ocean and atmosphere that this event would be one of the strongest events on record. 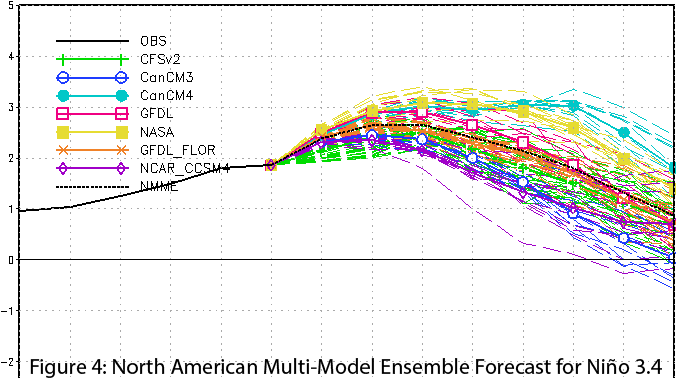 The North American multi-model ensemble currently shows a strong event extending into 2016 with gradual weakening heading into spring (Fig. 4). We continue to grapple with this El Niño event and the potential impacts it might bring to the Southwest over the winter and into spring, especially given current forecasts that have it pegged as one of the strongest events on record. Seasonal forecasts (see Fig. 5 on Maps Page) and past events suggest we might expect well above-average precipitation totals across our cool season. This does not mean we should expect a winter of daily rains, however. 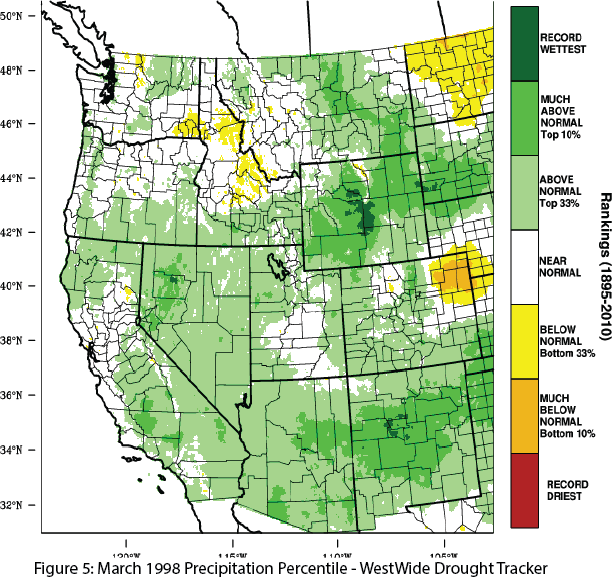 Variability across these months means we may see periods of below-average precipitation as well. 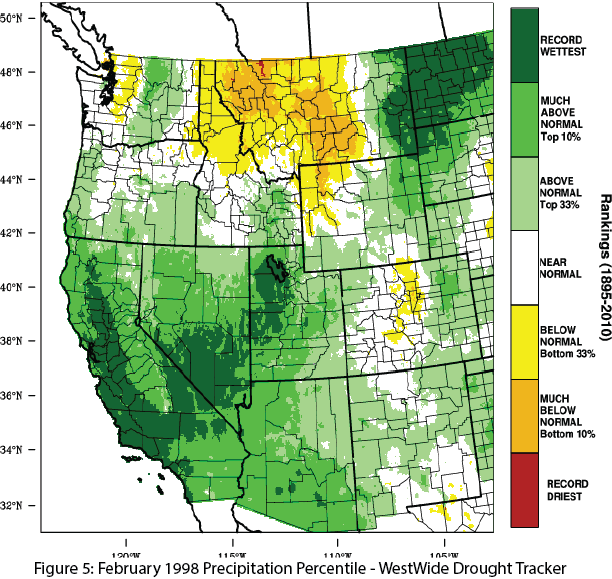 Looking at the 1997–1998 event—the strongest El Niño event on record—most of Arizona and New Mexico received above-average precipitation in December but below-normal precipitation for all of January before returning to normal or above-normal precipitation in February and March (Figs. 5–8). At this point, we are fairly certain that El Niño will remain on the current trajectory, and we will see one of the top three strongest events on record since 1950. This is likely to bring above-average winter precipitation to the Southwest, particularly later in the season, but it is far from a guarantee. Additionally, what happens in late spring and early summer may determine the longer-term impacts. 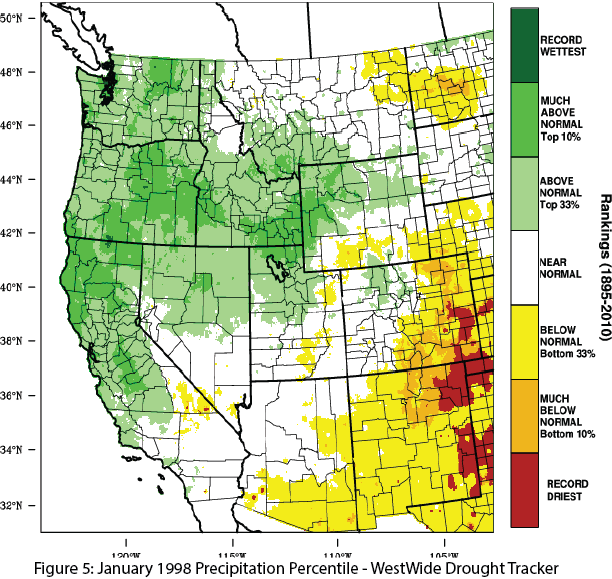 If we bounce back into La Niña conditions, as happened after the 1997–1998 event, we may see a return to more below-average precipitation forecasts heading into 2016–2017.